The Vatican released the much-anticipated encyclical by Pope Francis, Laudato Si' - Care of our common home, in 2015. This Q&A includes an encyclical definition and a look at why Pope Francis’ encyclical is so important for us. An encyclical is a letter circulated by the Pope to Catholic churches worldwide. It is sent directly from our Holy Father in Rome to Catholics all over the world and is often addressed to all people of good will, namely non-Catholics who may also want to read the document. Pope Francis' encyclical Laudato Si' - Care of our common home is addressed to "every person living on this planet". Papal encyclicals provide analysis, in the light of the Gospel and of the Tradition of the Church, on relevant issues for the faithful. Previous popes have issued encyclicals on a variety of topics, from the study of Scripture (Leo XIII, 1893) to the Redemption of Christ and the dignity of human beings (John Paul II, 1979). From 1891 onwards, many encyclicals were issued as a response to social problems, from the struggles of workers during the industrial revolution (Leo XIII, 1891) to the need for peace in the post-World War II era (John XXIII, 1963). These later encyclicals are part of what is known as Catholic Social Teaching documents. What kind of encyclical has Pope Francis written? The encyclical Laudato Si' is considered part of the Catholic Social Teaching tradition. Although there are many previous statements by Popes and Bishops on the question of the environment and faith, this is the first social encyclical in the Catholic Church to address care for the environment and environmental justice in a direct and specific way. Laudato Si' complements what the Catechism of the Catholic Church says, which is that our responsibility as good stewards of creation is to care for our world and not ‘steal’ resources from future generations. Pope Francis calls us to an ecological conversion, and invites us to praise God for the gifts of creation. Is this the climate change encyclical people were hoping for? In Laudato Si' Pope Francis speaks openly about the devastating effects of climate change on people and the planet. He says that climate change is real, urgent and it must be tackled. He also describes the climate as "a common good, belonging to all and meant for all". The nature of papal encyclicals means that Laudato Si' focuses on the broader issues of integral human development and stewardship of God’s creation. It highlights the greatest threats facing the human family today: climate change, growing global inequality and the destruction of nature. What is Pope Francis’ encyclical about? In Laudato Si' - On Care For Our Common Home - Pope Francis urges society to move away from the myth of perennial progress at the expense of the Earth’s resources, and calls on us to recognise that development which fails to respect the Earth is a false economy. Far from telling us how we must live, he calls for an open dialogue in society about how best to tackle the global issues we face. One of these global issues includes climate change and our Holy Father calls for a bottom-up approach that puts care for the very poorest at the centre of the way we live our lives. Pope Francis' encyclical emphasises the connection between environmental degradation and poverty, between the love for creation and poverty reduction and the interconnection between human dignity, human development and human ecology. Does Pope Francis talk about climate science? Pope Francis has engaged in a dialogue with scientists and scientific thought in order to prepare the encyclical, and he is very clear that climate change is real and urgent. The Pontifical Academy of Sciences, whose members advise the Pope on scientific issues, confirmed last year what most scientists have agreed on, which is that our planet’s temperature is increasing at unprecedented speed, mainly due to human activity and burning fossil fuels, in particular. The scientific question, however pertinent, is not the main point of the encyclical. It has a more theological and moral approach to the environmental dilemmas that threaten human development. The scientific view is complemented by the lived experience of Christian communities worldwide. This is what is known in Catholic Social Teaching as ‘seeing’ the signs of the times. What is ‘seen’ is afterwards analysed in the light of the Gospel and of the Tradition of the Church because an encyclical is not a scientific document, it is a faith-based one. As John Paul II said, “the ecological crisis is a moral issue” and all men and women have an obligation to contribute to the restoration of a healthy environment. Why is the Pope’s encyclical so important? Love and care for creation are an essential dimension of our faith. A social encyclical on human development and the environment, like Laudato Si', helps Catholic believers address, reflect and respond to the environmental challenges our world is facing today. It helps us answer difficult questions such as: how do we love our neighbours in need by sharing wealth and at the same time love our Earth by promoting sustainability? How do we promote economic growth and respect the common good? In September 2015, global leaders met for a United Nations Summit in New York to negotiate new Sustainable Development Goals that will set the direction and targets for development for the next 15 years. Pope Francis spoke at this meeting. In December 2015, international leaders met in Paris to secure a global climate deal. In both meetings, international decision makers were making critical choices about development and the environment that could impact the lives of millions of people, especially our brothers and sisters living in the poorest countries. In this context, the timing of the Pope’s encyclical couldn’t have been more pertinent. Why has the Pope published his encyclical now? The Vatican published Laudato Si' on 18 June 2015. It was published in eight languages. A framework for providing the necessary aid for poor countries to develop. This summit is called 'Financing for Development'. A new set of Sustainable Development Goals to reduce world poverty by 2030. A new internationally binding agreement to reduce carbon emissions and limit global temperature rise to 2°C. What can I do to tackle climate change? Tackling climate change is part of our duty as Christians to love and care for God’s creation; it’s an important dimension of our stewardship of the Earth. Our sisters and brothers across the world are being pushed deeper into poverty due to the changing climate and our faith moves us to speak out in solidarity. There are many different ways to tackle climate change, either individually or in a group, and one effective way is campaigning for change. We can call on politicians to go further and faster with emissions cuts. If we don’t act now to reduce our pollution and environmental impact, many more people could be at risk of losing their livelihoods and everything they cherish. What will the encyclical mean for the Catholic community? As with all Church teachings, Catholics have a particular responsibility to engage with and reflect upon the message of the encyclical and find ways to apply it to our lives. By gathering together the main faith statements on love for creation in one document, and by bringing a novel and refreshing view on them, Pope Francis’ Laudato Si' encyclical could motivate Catholic communities to promote environmental justice in an unprecedented way. 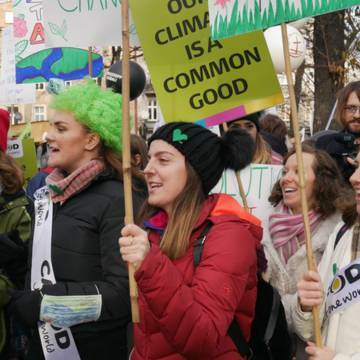 CAFOD supporters have already been responding in positive ways, putting their faith into action by living simply, praying for our world and by lobbying politicians to tackle climate change. In the coming weeks and months supporters will be using our encyclical study guide and other helpful resources to pray and reflect on some of the themes of the encyclical. The resources are available to download for free from our website and you can also order a physical copy. How can I respond to the encyclical? Prayer and reflection on God’s gift of creation are good ways to respond to the papal encyclical. You can use our study guide to get sound theological context for the stewardship of creation. CAFOD stands for the Catholic Agency For Overseas Development. We bring hope and compassion to poor communities, standing side by side with them to end poverty and injustice.